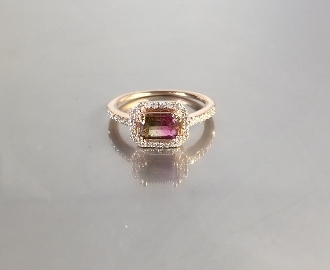 This gorgeous ring has a stunning watermelon tourmaline set in solid 14 karat rose gold with white diamonds all around the stone and on the shank of the ring. This is a breathtaking piece. The size of the watermelon tourmaline is 5x7mm and total weight of the stone is 0.8 ct. Default picture shows thre rings stacked together. Each piece sold separately!